72 registered members (Alan_nc), 416 guests, and 272 spiders. Hi, what would be the noticable difference between the srm race cam and the stock profile on a "stock" a65 thunderbolt. Advantages? Disadvantages? High revs, more torque, better acceleration. Its a really good cam and works well with small ports, I used mine with 1.125 radius tappets (had them ground, std is 1.25) you also want their race springs otherwise the standard ones will break. Mine was fitted with a early lightning head with the small ports made smaller, and 928 carbs. It pulled in top gear from 1500rpm and just kept pulling. Can't resist this one. The word 'race' should tell you something. You will need race springs which will accelerate wear in the valve train and this will mean frequent vale adjustments. Allan reground the lifters (around 200 bucks) which deceased the overlap. This would make it a bit less racey. A good move for a street bike. A standard T-Bolt head would limit the cam's ability to breath better at high rpm. So, some big bucks for not a whole bunch of poke. Me either. 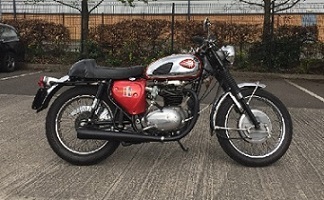 I don't know if all Thunderbolts had the Spitfire profile cam, but latter ones did, BSA advertised this excellent cam as a 'race cam' and BSA had great cam designers. I read that the F1 Repco Brabhams that dominated in the '60s used BSA cam profiles. A more racier cam will not improve the Thunderbolt much, if at all. The cylinder head makes the biggest difference to performance. All the racier cam is trying to do, is to get more air flowing into the engine, it manipulates the dynamics of the air as it travels through. It can bias the motor to produce it's power at higher rpm, ie if the inlet closes later, or if it has higher valve lift, a high speed inlet charge will keep filling the cylinder as the piston rises, more air to burn more power, to achieve the speed in the charge though it requires more rpm or more displacement. And as the head or more precisely the inlet ports are the limiting factor, you are addressing a cam that isn't any where near the limiting factor. The Spitfire cam will make good power to 9,000rpm if the head breaths well. And you need a well modified twin carb head for that. Last edited by Mark Parker; 04/16/19 12:36 pm. Don't put a "race" anything into an A65 unless you plan to buy a better quality oil pump and connecting rods, and change the crankshaft oiling system to a quill-type end feed, like Triumphs use. Some one better tell Pushrod Tom about the crank.... I beleive he is still using a bush on the Hornet racer without issue, Isn't that right Tom? Why do you need a better oil pump? it will output oil relative to the revs of the engine and most of the time at revs it will be blowing off oil pressure - not doubting though that its beneficial for any engine, same goes for the con rods, there is less dynamic pressure on the rods/pistons/cranks when thrashing a bike than when someones lugging a motor then opens the throttle without changing down. A more racier cam will not improve the Thunderbolt much, if at all. From 66 I think all single carb 650's had the 473 cam. From using that cam (and liking it) it works well with small ports as it seems to widen the available torque range, granted im using a dual carb head instead of a single carb but at those rev ranges I doubt it would be any different for 1 or 2 carbs. Srm oil pump, map connecting rods, kibblewhite valves and springs and an ard magneto. Havent changed to quill feed though. Trying to find someone local that can do that for me..
Then I guess you are ready for that "race cam." Just don't count on beating any 500cc bike built after 1980.